On October 16, 2013 the Manitoba Legislature proclaimed October to be Islamic History Month in the province. Manitoba became the first province in Canada to designate an Islamic History Month. The month of October will now recognize and celebrate the history and heritage of Muslims in Manitoba, Canada, & beyond. The inauguration of IHMC took place on October 25, 2007 when Canada's Federal parliament officially declared October as Islamic History Month in Canada. Now in its eighth year, IHMC has been proclaimed in more than half-a-dozen cities across Canada. Manitoba’s Muslim community has grown to more than 9,000 people from 48 different national/cultural backgrounds. 2015’s theme for Islamic History Month is ‘KNOW EACH OTHER’: HONOURING CANADA’S FIRST NATIONS, MÉTIS AND INUIT PEOPLES! Visit the calendar of local and national events during Islamic History Month. Just four years after Canada's founding in 1867, the 1871 Canadian Census reported 13 European Muslims among the population of Canada. These were followed by significant number of Muslims from the Balkans; some who came prior to the First World War. 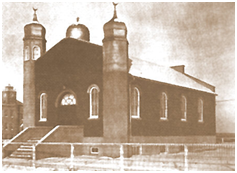 Al-Rashid Mosque became the 4th mosque built in North America when it was built in 1938 in Edmonton, Alberta. At the time there were about 700 Muslims in Canada. Hilwi Hamdon was a leader in the effort to build the mosque in Edmonton. She approached then Edmonton Mayor, John Fry about purchasing land to construct the mosque. She along with friends was instrumental in collecting funds from the community, including Jews, Christians and Muslims to construct the Mosque. The building that housed the Al-Rashid Mosque is now part of the museum at Fort Edmonton Park. After World War II Canada experienced a small increase in the Muslim population. However, Muslims were still a distinct minority. Changes to Canada’s immigration policies that began with the removal barriers to non-European immigration in the late 1960s and early 1970s led to increased numbers of Muslim immigrants from around the world and Muslims began to arrive in Canada in significant numbers. Muslim immigration to Canada grew significantly in the last decades as a result of increased global migration, conflict in predominately Muslim countries or those with significant Muslim populations, and Canada’s labour market requirements. Today, Canada’s Muslim population is growing at a rate exceeding other religions, according to Statistics Canada. Canada's 2011 National Household Survey reported that there were 1,053,945 Muslims in Canada or approximately 3.2% of the population. This makes the Muslim community the second largest religion, second after Christianity. In the Greater Toronto Area 7.7% of the population is Muslim. This makes Toronto the North American city with the highest concentration of Muslims in any city in North America. In Canada, the majority of Muslims are Sunni, while a significant minority are Shia. People of Muslim faith have a global presence with Muslims predominate in 30 to 40 countries. Muslims of Arabic ethnicity account for fewer than 20% of all Muslims. Therefore, Muslims in Canada and worldwide come from a rich diversity of languages, cultures and origins. Muslim peoples and civilizations have made many contributions to World civilization and to many fields. It is important to know and understand the history of Islam and of Muslim peoples here and around the world. Muslim History is Canadian and World history. The Manitoba Education and Training Library provides Manitoba Kindergarten through Grade 12 educators with curriculum implementation support, educational research and professional development materials. 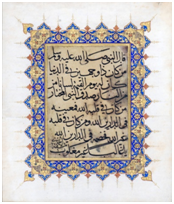 The library collection has numerous resources related to Islamic history and cultural diversity. Educators may search the enhanced Online Catalogue that is now available. The enhanced online catalogue already includes links to various electronic resources, database, and streaming collections. This Canadian site offers information on Muslim History and it’s golden past with modern day examples that touch our lives daily, an acknowledgement to those who have contributed to the betterment of humanity throughout the ages, and an overall celebration of Islamic history summarizes Islamic History Month Canada [IHMC]. The Encyclopedia of Islamic History is the work of scholars whose intent is to create an enduring record of the role played by Islam in global history. It is maintained by the American Institute of Islamic History and Culture based in California. Professor Dr. Nazeer Ahmed (nazeer.ahmed@delixus.com) serves as its director. This site is from a leading and award-winning international science and cultural heritage organization. The resources provided by the organization cover the Muslim civilisation which stretched from Spain to China. “From the 7th century onwards, men and women of different faiths and cultures built on knowledge from ancient civilisations, making breakthroughs that have left their mark on our world. Information about the 1001 Inventions educational programmes, blockbuster exhibitions, award-winning films, books and international productions is available. The 1001 Inventions Teachers Pack may be downloaded. The BBC provides an overview of basic information and resources with respect to Islam. This recent PBS Frontline addition examines Islam through stories of diverse Muslims. The resources include "Frequently Asked Questions" that concisely explain the basic principles of Islam, including the most widely accepted definition of ‘jihad.’ The site provides a wealth of fascinating facts about Islam through the portrayal and interviews of various Muslims from around the world. Islam World provides a thorough introduction to the religion for non-Muslims. The Internet History Sourcebooks from Fordham University by Paul Halsall are wonderful collections of public-domain and copyright-permitted historical texts for educational use. The Islamic Sourcebook's documents are well organized and the breadth of the collection is impressive. The focus of this site is on Islamic contributions to science and learning, but there are many useful and informative history-related sections and features. Turning the Pages is an award-winning interactive display system developed by The British Library to increase public access and enjoyment of some of its most valuable treasures. Visitors to the site are able to virtually "turn" the pages of manuscripts. There are currently many treasures on display in Turning the Pages, including Sultan Baybars' Qur'an. Global Connections: Putting World Events in Context is a PBS feature that provides the background information needed to understand events occurring in the Middle East and Liberia. 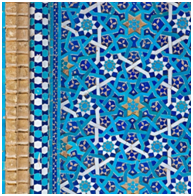 The Middle East portion of the site includes original materials created in conjunction with the Centers for Middle Eastern Studies at Harvard and UCLA. The site collects and contextualizes the wealth of resources available throughout public broadcasting, including material from Frontline, Online NewsHour, NOW with Bill Moyers, Morning Edition, Talk of the Nation, and others. Designed for educators, the site is also useful for those wishing to better understand the Middle East and its relationship with the West. The site is organized into 3 sections: Timelines, Connecting Questions, and Exploring a Theme. A general site on Islam that provides information about the Quran and Islam. This website provides “A Window Into Islamic Holidays, Traditions And Cultures For Students Grade 4-8.” The resource comprises over 100 minutes of digital video from the award-winning PBS series RELIGION & ETHICS NEWSWEEKLY the site also contains high quality, multi-media tools; downloadable lesson plans; and resources related to Islamic holidays, traditions and cultures. The video segments can be used alone, or in conjunction with any of 10 lesson plans which are aligned to US national standards and vetted by an advisory committee of experts in education and Islamic cultures. The video segments may be watched online or downloaded. Article by Huma Ahmad from Jannah.org, an informational website created by a not-for-profit dedicated to teaching about Islam. 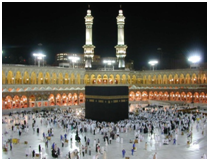 This site is dedicated to provide information about important Islamic landmarks and their significance. Photographs and facts of these ‘landmarks’ are provided with the intention of giving Muslims and non-Muslims reference for to Islamic history and the importance of past personalities and places. Foundation for Science, Technology and Civilisation (FSTC) is a British not-for-profit, non-political, and non-religious organisation founded in 1999 by a group of philanthropic historians, scientists, engineers and social scientists. It is dedicated to researching and popularizing the history of pre-Renaissance civilisations, especially the Muslim civilisation, that have had an impact upon the scientific, technological and cultural heritage of our modern world. Established in 2002, the web portal Muslim Heritage was the first major project of FSTC. The website contains more than 1000 peer-reviewed articles, hundreds of short reports on news and events related to Muslim heritage research, and an interactive map and timeline.